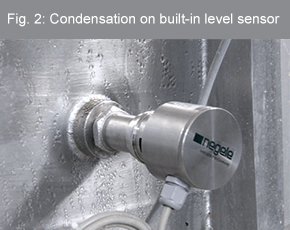 level measurement, a pressure sensor located at the lowest point in the tank measures both the pressure of the fluid column above it and air pressure. 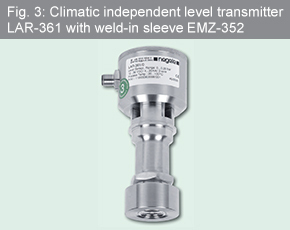 To obtain the correct level, the measurement result must compensate for the air pressure. Otherwise, air pressure fluctuations, which usually range up to approx. 50 mbar, would lead to measurement result variations of up to 16% in a tank filled three meters high. To avoid this inaccuracy, the air pressure must be compensated for in the result. 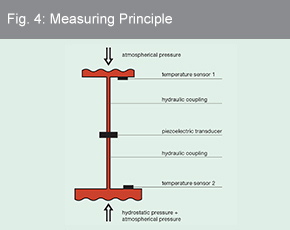 In a so-called relative pressure measuring cell with equalizing capillaries, a thin tube conducts the atmospheric pressure from the environment to the rear of the measuring membrane. Because the air pressure now acts on both sides of the membrane, the resulting measuring signal represents only the hydrostatic pressure of the medium being measured in the container (Fig. 1). In the other procedure, which features a closed relative pressure measuring cell and an integrated permeable double membrane, separate pressure membranes are used for the atmospheric pressure and the hydrostatic pressure. Both the equalizing capillary method and the double membrane method have a decided disadvantage: The diffusion of water vapor cannot be prevented in the long term. As mentioned, when operating the measuring cell in a tank with a cold medium surrounded by warm humid air, the water vapor condenses (Fig. 2). This occurs when the temperature drops below the dew point at the measuring cell, which is the coldest point in the system. Humidity that has entered the sensor results in sensor drift or in fluctuating readings and ultimately leads to the destruction of the measuring equipment. The sophisticated LAR-361 (Fig. 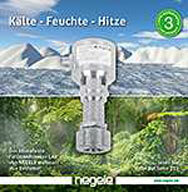 3) hydrostatic level sensor from Negele Messtechnik GmbH, which has been on the market for a number of years, differs from other measuring equipment in that the measuring system itself is hermetically sealed. This prevents gases and humidity from entering the system. In addition, the relative pressure measuring cell is still capable of providing readings in which the air pressure has been compensated for. The main difference to systems with permeable membranes is that in this unit, the atmospheric pressure is measured by a second measuring cell integrated in the sensor. This cell is hydraulically connected with the membrane of the process pressure measuring cell, which is in contact with the medium being measured (e.g., milk). The measuring cell for the atmospheric pressure (= pressure measuring cell for the ambient air pressure) conducts the measured pressure onto the rear of the process pressure measuring cell via an oil-filled tube. With the atmospheric pressure compensated for in this way, the reading is a measure of the hydrostatic pressure only, which in turn can be used to establish the filling level of the container. A further special feature is that both the process pressure measuring cell and the air pressure cell are hermetically sealed and hydraulically coupled (Fig. 4).This design prevents the penetration of humidity into this sensitive area. Thus, the approach of this method is to solve the root of the problem rather than to correct the effects. 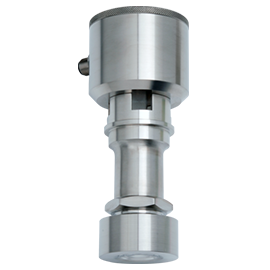 The coupling medium consists of an FDA-approved oil filling. In addition, the pressure sensor is equipped with temperature sensors attached to the measuring cells, which can be used to adjust for temperature changes. In humid and wet environments, both indoors and outdoors, in which conventional sensors cannot be effectively used and have a reduced service life, sensors with this design are a reliable alternative.